Noybel Gorgoy was born and raised in the Caribbean Island of Cuba. She was always involved in the kitchen with her parents. After graduating from the National School of Arts in Habana, Noybel began to fully discover the world of food and the art of experimenting with the various ingredients available. When She arrived in America in 2004 Noybel was overwhelmed by the diverse choices of foods. She found her health suffering as she sampled from various foods and their wide range of qualities. Noybel decided to take her health back into her own hands and help others to understand the differences in their food choices. She enrolled and completed her Professional Plant Based Certification from Rouxbe Online Cooking School, in 2015. A Professional Certification Course lead by world-renowned plant-based chef educator Chad Sarno. Inspired to share all the information she could, In 2016 she created Noybel’s Kitchen. A platform to share the message of healthy Plant Based Foods influenced by her Cuban heritage. In 2016 she partnered with Trinity Alignment to create her first cookbook Noybel’s Kitchen Cuban Flair Plant Based Cuisine. A wonderful introduction to 18 plant-based recipes with a Cuban flair. Noybel has traveled around the world as a professional singer, musician, and performer. She has been part of projects like Havana Night Show performing up to 20 000 people at the Seminole Hard Rock Arena in Miami. She has worked with some of the top musicians and headliners in Las vegas and, recently Gorgoy was featured at the Palazzo Theater with the show Between the Lines with Clint Holmes. She has also headlined with The Hot Club of Las Vegas at Django Vegas Music Festival and The House of Blues to name a few. Today, Noybel is passionate about life, health, the best foods available and health-giving nutrition. Her desire is to inspire others to fall in love with the Plant Kingdom and embark upon their creative culinary adventures. 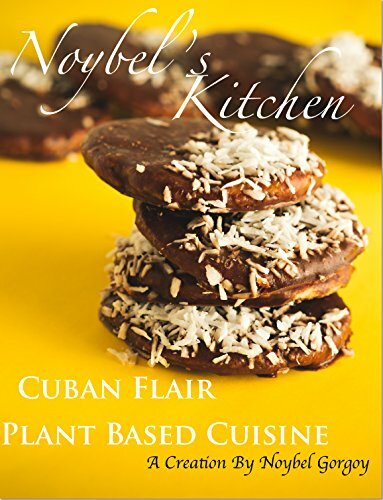 Click the link below for the Paperback Edition of Noybel's latest cookbook.